Other assets are a 10.0% stake in Ascend Capital, a 67.12% stake in Bibop and a 8.9% stake in Geosim. Since these assets are small and no useful information is provided for a valuation I’m going to assume that these are worthless too, and only focus on the core assets. Sipiem, which owns 66 per cent. of Ondaland, Italy’s largest water park, recorded revenues of EUR 5.1 million (2011: EUR 5.9 million), EBITDA of EUR 2.1 million (2011: EUR 1.7 million) and a consolidated profit after tax of EUR 0.9 million (2011: Loss after tax 0.2 million). As at 31 December 2012, Sipiem had a consolidated net asset value of EUR 11.3 million. Because Clear Leisure and (some of) the holding companies further down in the corporate structure own just partial stakes in the businesses they control you have to be careful to account for the impact of minority interests. Revenues and EBITDA are measures before taking into account minority interests while the earnings and net asset value numbers are (probably!) after minority interests. Valuing Sipiem at €11.3 million might be a bit too optimistic, but it would be at 12.6x earnings and 5.4x EBITDA so it’s probably in the right direction. In 2012 Clear Leisure bought a 11 percent stake for €800 thousand, valuing the company at €7.3 million. Given that earnings and EBITDA (but not revenue) increased compared to 2011 this might actually be an investment that increased in value. The €7 million funding mentioned earlier was done for a 27% equity stake in Ondaland. This implies that Ondaland is worth €26 million and that Sipiem is worth €17.3 million. If Sipiem is worth between €7.3 and €17.3 million the 50.16% stake of Clear Leisure could be worth between €3.7 and €8.7 million. You Can recorded revenues for the year of EUR 1.7 million (2011: EUR 1.1 million), an EBITDA of EUR 177,156 (2011: EUR 61,626), and a consolidated profit of EUR 52,003 (2011: loss of EUR 562). Based on this limited disclosure of growth and profitability I think this chain could be worth a decent amount, but a lot depends on future growth prospects. Clear Leisure paid €751,500 to acquire its 50.1% stake, and I’m guess that it’s still worth this much, and potentially twice this amount or more given the impressive growth last year. The other 49.9% was acquired in January this year, but I assume that the value of this part is offset by an equal amount of debt. A valuation for Sosushi between €1 and €2 million seems a decent guesstimate to me. Clear Leisure is thinking about spinning of their restaurants division: questionable in my opinion given the small size of both the parent company and this division. The project land is appraised at €35.6 million while it has €10.3 million of associated debt. The other assets have an appraised value of €4.2 million with €5.9 million in associated debt. In the debt restructuring the company wants to pay creditors the €10.3 million of debt related to the land and €1.7 million related to the negative equity of the other assets. After this transaction Mediapolis would only own the undeveloped land and it would be debt free. Clear Media announced in Januari this year that they had received an initial positive reply from the court, but a month later the court decided that it needed more information due the complexity of the restructuring plan. The company appears to be confident about the outcome of this process because they already announced a conditional 2p special dividend. To find the value of Clear Leisure it’s a matter of adding up the various pieces and deducting a number for the amount of debt at the holding company level. How much this exactly is, is a bit of a guess because the latest interim report doesn’t have the necessary footnotes to figure it out. But we know that the company had €2.0 million in convertible bonds at the end of 2012 and €3.5 million of payables for total liabilities of €5.5 million. But since then the company has issued €3.1 million in new debt to buy back debt at a significant discount and approximately a million in liabilities were removed from the balance sheet by issuing new shares (already incorporated in the current number of outstanding shares). Clear Leisure has a terrible track record, the valuation is imprecise at best, and if the sale of the Mediapolis asset fails intrinsic value/share will probably continue to melt away like an ice cube on a hot summer day. Having said that: I think that at current prices it’s a attractive bet. It’s pretty likely that they will be able to sell the Mediapolis asset and they already announced their intention to return 2p/share: giving investors a freeroll on the value of everything else. 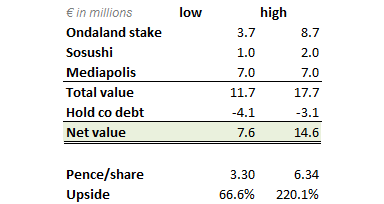 Ondaland and Sosushi appear to be decent assets that could provide a lot of upside. Don’t think it is prudent to allocate a large part of the portfolio to this idea though given the risks involved. You can find a couple of posts with more info and background at the PhynixManifesto blog. This entry was posted in Portfolio and tagged CLP.L on March 10, 2014 by Alpha Vulture. Really like this idea, great find Alpha. Also like how they are recent owner-operators – the CEO and Chairman both acquired the majority of their stakes in 2012 – so the previous prior terrible performance is before they took over steering the ship. The chairman also has a very successful entrepreneurial background – so much so he even writes a column for the FT! Quite annoying how the interims don’t do the company / group accounting split as it makes it v hard to work out the change in hold co debt / NCA deficit, as you note. Also wish they’d provide more disclosure around the subsidiaries as exact valuation is difficult – that said the margin of safety here seems so big as to provide decent protection anyway. The involvement of Luke Johnson in the company is positive, but he already quit his chairman role and while he still owns his stake the value of it appears to be minimal compared to his overall net worth. And the current CEO is still the same guy that started this mess in the first place. The board is looking for a replacement, so could be worse, but not that thrilled about the insiders. About the accounting; do the book values of consolidated and unconsolidated balance sheets ever match up exactly? I guess it could be as simple as some of the investments being accounted for at historical cost in the unconsolidated financials while in the consolidated financials the current book value is used. I don’t know exactly how this works. Ah that’ll teach me for not reading all the RNSes before I post, thanks for correcting my error! OK, I’m less enamoured now but at least Villa has a reasonable personal stake in the equity and hopefully Luke Johnson still keeps an eye on things. May just be wishful thinking on my part…! Up to 0,03 now in the last few days. Are you still holding? It looks really intesting. Great find. Just one question, how do you calculate the debt level in the holding company? I took a quick look at the financial statements of FY2012 and half year 2013 and I see a debt level of €18M (short term) + €6M (long term). Same thing with the payables. Although you exclude the debt of Mediapolis (€10,3M + €5,9M) you still have around 8M Pounds. I think I’m missing something here to reach to your 4/3M pounds. The company also provides an unconsolidated balance sheet. This allows you to see how much debt there is at the hold co level. CLP has been very bullish about the court decision indeed. I mostly agree with your valuation of their assets. However, taking a less sanguine view to the extent of their liabilities, I believe them to be currently fairly valued. I would appreciate any comments. Thanks! Currently traveling in Argentinia, but will check out your post when I get back. Not sure what you have exactly included in the liabilities, but you have to realize that the valuation of the various assets already incorporates the liabilities that belong to those assets. Don’t double count them: you only need to value the liabilities that are outside the already valued components. I had another look and realised that my taking the UK segmental liabilities wholesale was erroneous . I initially thought Ascend Capital would make an insignificant portion of the UK assets and not materially affect my valuations. In hindsight I may not have been doing much thinking when I did that! It shows how important it is to assess each factor with care. A chink in the armour may prove lethal. In this case, I take some comfort that I erred on the more conservative side. Thanks for your input, AV. Hope you had a good trip in Argentina. Did you find the situation on the ground any different from the reports on inflation we have been hearing? I took a lot of dollars with me when I went to Argentina. You get a nice discount on your vacation when you exchange on the black market (pretty shady in some cities though) instead of using an ATM (got 10.4 peso/usd instead of the official 8 peso/usd). And a lot of businesses give you another discount if you pay with cash instead of electronically.